This filly is by the all conquering WRITTEN TYCOON and is a sister to the quality performer Diamond Baroness. A real 2yo filly heading to the leading 2yo stable in Australia in Hayes and Dabernig. 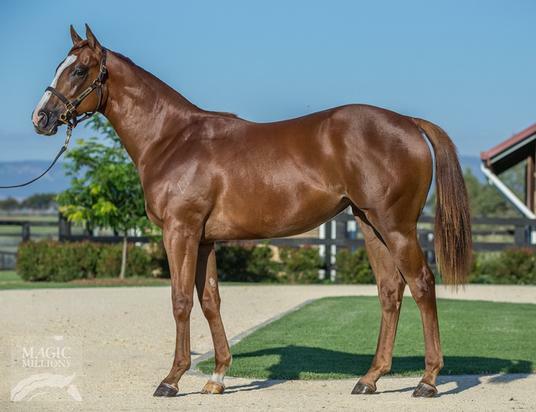 Lot 440 - MM 18 - Written Tycoon x Will Rock FINAL PDS from Dalziel Racing on Vimeo. Diamond Baroness (f. by Written Tycoon). 5 wins to 1400m, A$198,220, to 2016-17, VRC Owner.racing.com H., 2d VRC Asian Executive H., MRC Le Pine Funerals H., 3d Bendigo JC Gold Bracelet, 4th VRC Frances Tressady S., Gr.3. Purely Precious (f. by Purrealist). Winner at 1600m in 2016-17, 3d Warrnambool RC VOBIS Gold Strike. Our Free Will (f. by Statue of Liberty). Winner at 1000m in 2017-18 in Aust. Sheza Scandal. 4 wins at 1100m, 1200m, WATC Magic Millions Raceday H., Peacock Brothers H., Christmas in July at Belmont H., 2d WATC Perth Racing on Facebook & Twitter H., Ladies Day at Ascot H., Perthracing.org.au H., 3d WATC Tabtouch Home of Racing & Sport H.
Miss Dundee. Winner at 1100m in 2016-17 in Aust. Our Testament. Winner at 1200m in Aust. Sky's Will (Sky Filou). 7 wins from 1250m to 2400m, A$99,525, WATC Swell Baby H., Budget Driver Protection H., Pink Healthcare H., Wattleup H., 2d WATC RA Rigg Quality H., Race Calling H., 3d WATC Winter Cup, Gr.3, St Leger, L, Helena Vale Cup, L, Part Pago H., Kings Park H., Boab H., Heatlock H.
Whoopi Kitten (Fusaichi Pegasus). Winner at 6f, 2d Monmouth Crank it Up S., L, Dearly Precious S., L.
Dawne of Moxie (El Moxie). 5 wins from 1300m to 1600m, TRC Thorpe Transport H., BR Speers H., Kelato H., 2d TRC Wood & Baillie Catering H., Holyman Townsend H., Southcorp Wines 2YO H., 3d TRC One Thousand Guineas, L, CN Goggin H., Navy Week H., Summerhill H. Producer. LAUREN TATE (Pins). 4 wins from 1400m to 2000m, NZ$178,400, A$28,000, Cambridge JC Travis S., Gr.2, Otaki Maori RC Cavallo Agistment H., Whangarei RC Northland Waste H., 2d Cambridge JC Travis S., Gr.2, Matamata RC Waharoa Transport H., BOP RC New World Summer Cup, Rockhampton Cup, 3d BOP RC Japan-New Zealand International Trophy, Gr.2, Waikato RC Hamilton Party Hire H., 4th ARC New Zealand S., Gr.1, Waikato RC Herbie Dyke S., Gr.1, BRC Chairman's H., Gr.3, WRC Cuddle S., Gr.3, Qld Tatt's RC Tattersall's Mile, L.